Candidates can check the latest 10th Pass Govt Jobs 2019 from this page. Many people who had completed their 10th standard are generally preferred the Government Jobs. So all the aspirants are suggested to check the Latest Job Govt Openings 2019 from this page. Many of the candidates think that Govt Jobs are only for higher qualified people but there are also vast opportunities for those contenders who had finished their 10th. We insist to the people the given page is only for the contenders those who had done their 10th. Many of the organizations like India Army, BSF, Air India, RRB, BSNL, Indian Post Office, Naval Dockyard, IAF, MCGM, Delhi Police, UPPSC, RBI etc are ready to recruit the 10th Pass job seekers into their organization. Now, if you are wondering about the Central Government Jobs that are available after 10th, then you can find them all in this article. Because there are many opportunities that are provided by the Central Government Organization. Well, you can apply for many Miniratna, MahaRatna Companies. These Jobs will help you in getting settle down in a Good Government Organization. Even the salary will be good. Apart from Central Government Organizations, there are even many 10th Pass State Government Jobs 2019, which you can check on our site. Aspirants can find the latest 10th Pass Govt Jobs 2019 from here. We have updated the latest 10th pass central government jobs 2019 and state govt jobs for 10th passed freshers in this page. The current article only belongs to the contenders those who had completed their 10th Standard. There are many career opportunities in the Government Sector for the 10th Pass candidates. And to get the correct and genuine details about the 10th Pass Govt Jobs 2019 check this page frequently. Because we always maintain it with fresh and trending stuff. So that you can easily check the 10th Pass Government Jobs from this page. Scroll down the current page and find out the latest updates. We all know that these days a huge number of the candidates are preferring the Government Jobs. Because the Government Jobs provides job security, many of the benefits to the aspirants, good salary package along with the grade pay etc. Due to some personal reasons, a large number of aspirants have discontinued their studies up to 10th Standard. And some of them cant effort higher education. At present all the aspirants are eagerly waiting for the 10th Pass Government Jobs in various organizations. For those students, we have tried our level best and gathered most precise information and shared on this page. In the above table, aspirants can get the latest Govt Job Openings 2019 for 10th Pass students. Nowadays all the people are seeking for the Government Jobs For 10th Pass 2019 on the internet. This year an immense number of Govt Job Openings 2019 are available for the 10th Pass students. We are ready to give the precise information for the sake of candidates related to 10th Pass Govt Jobs 2019. Pretty much information related to Government Jobs For 10th Pass 2019 is available here. From the above table, you can easily check the latest 10th Pass Government Jobs in Railway 2019, 10th Pass Jobs in Air Force, 10th Pass Jobs Online Apply 2019, 10th Pass Police Jobs 2019, 10th Pass Jobs in Indian Army 2019, 10th Pass Bank Jobs and much more. There are a lot of job openings in the Government Sector for 10th Pass candidates. Go through the complete article and apply for the vacancies if you are eligible for the particular openings. Before starting your application process, all the job hunters need to check the eligibility criteria details such as age details, education qualification, salary details, application fee, selection process etc. By checking the details you can easily get an idea about whether you are qualified for the post or not. Also, apply through online mode for 10th Pass Govt Jobs 2019 from this page. Candidates are suggested that be ready to Apply Online For Latest 10th Pass Govt Jobs 2019 for various posts like Lower Division Clerk, Technical Assistant, Jailor & Warder, Driver, Multi Tasking Staff (MTS), Anganwadi Worker & Anganwadi Assistant, Staff Nurse, Personal Assistant, Jr Intelligence Officer, Senior Deckhand, Constable, Helper, Tradesman Mate, Wireman, Stenographer, Village Level Entrepreneur, Junior Assistant, Material Assistant, Extension OfficerApprentice, Apprenticeship Training, Technical Staff, Mess Staff, Electrician, Cook, Civilian Motor Driver, Clerk, Lab Assistant and more vacancies are available in various departments. Every year many of the organizations release many vacancies for the candidates to reduce the ratio of unemployment in India. As we all know that most of the unemployed contenders are very anxiously finding for the Government Jobs. Especially a lot of students are curious about the 10th Pass Govt Jobs 2019. In the simple method, we have given all the useful details from this page. Without search burden find all the latest and upcoming 10th Pass Government Jobs 2019 on a single page. There are various vacant positions are waiting for the students those who had completed their 10th Standard. Good news for the aspirants who had completed their 10th standard. Because an immense number of Government authorities are ready to hire the suitable contenders into their organization. Many of the job hunters are trying to get a job in government sector. But getting a job in the Government sector is not an easy matter. All the aspirants need to work hard. After completion of the registration process, immediately start your preparation because there is a heavy competition. So keep in mind and prepare well and secure a job in your dream organization. We are always with you to help the candidates in a correct way. Check the above posts and if you are eligible then as soon as possible submit your forms before the closing date. Many of the organizations didn’t accept late applications from the contenders. Also, contenders must and should have minimum 18 years meanwhile the maximum age depends upon the particular organizations. The age relaxation is applicable for the candidates according to the rules and regulations of specific authority. Without wasting single minute bookmark this page by pressing cntrl+d and get the quick updates which we have given on this page. 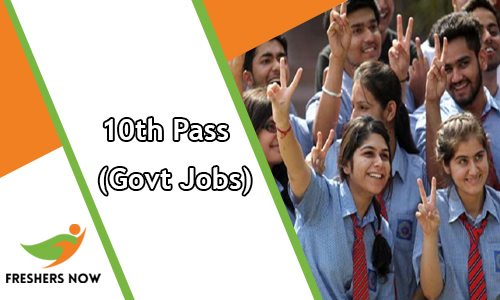 By visiting this page all the aspirants belong to 10th Pass Govt Jobs 2019 get the latest openings 2019 that is officially given by the various departments. Our advice is to keep in touch with us regularly and find the latest 10th Pass Government Jobs 2019 from this page. We hope all the candidates satisfied with this post. Visit our website www.freshersnow.com regularly.